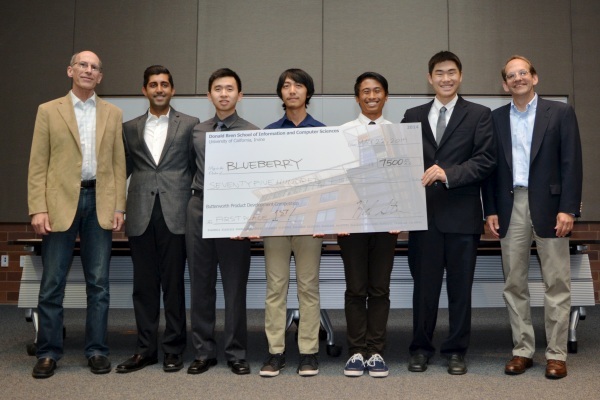 To the naked eye, this year’s Butterworth Product Development Competition at the Donald Bren School of Information and Computer Sciences looked much as it always has. All throughout the California Institute for Telecommunications and Information Technology (Calit2) in late May, teams of earnest students, under the watchful eye of their industry, faculty and alumni mentors, gave impassioned presentations about their innovative projects to a panel of distinguished judges, with the results announced at a festive gathering that evening. But if you’d been to previous installments of the contest, you might have sensed that there were perhaps more snappily dressed students around. Well, there were – roughly twice as many. 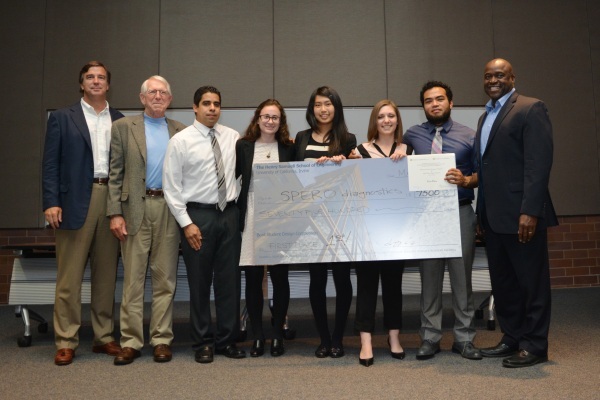 The 11th annual Butterworth development competition was also the inaugural year for the Beall Student Design Competition. The Butterworth competition is named for, and generously supported by, Bren School alumnus Paul Butterworth (B.S. ’74, M.S. ’81), chief technical officer of AccessG2 Inc. The Beall competition is made possible by the generosity of the Beall Family Foundation. Where Butterworth emphasizes software, and requires that at least one team member be from ICS, Beall focuses on hardware, and requires that least one team member be from the Samueli School of Engineering. The two competitions were not only concurrent and complementary, they also overlapped: Several teams entered their projects in both competitions. There was also more prize money at stake – a total of $30,000 between the Butterworth and Beall contests. Here are the teams who took home the prizes. This product addresses the dangerous, even deadly prevalence of sepsis in hospital settings. Today, a full sepsis diagnostic process takes up to four days, requires multiple tests, advanced trained personnel, and costs several hundred dollars. Spero Diagnostics’ goal was to reduce that time frame to less than three hours and bring the cost down to under $100. Their design is a software package that automates a device that performs complicated diagnostic tests and reduces the volumes of reagents and samples. The design also includes pre-filled blister packs that both store and dispense all the appropriate reagents and volumes needed to perform tests. The automated device and blister packs will allow a minimally trained user to perform complicated sepsis diagnostic tests at the point of care. 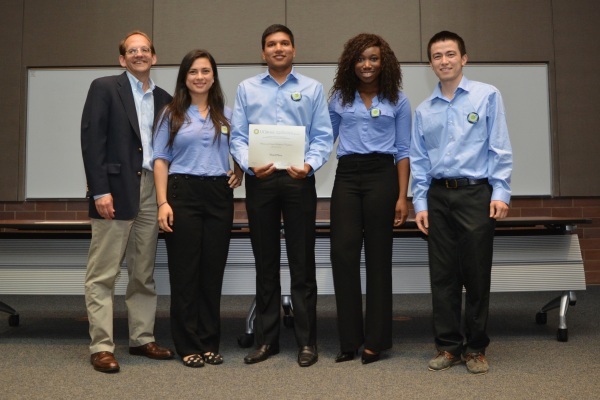 Team Spero Diagnostics: Jessica Motherwell, Jose Gallegos, Ernesto Sosa, Ting-Yi Chu, Maka Pennell, Zachary Campagna. 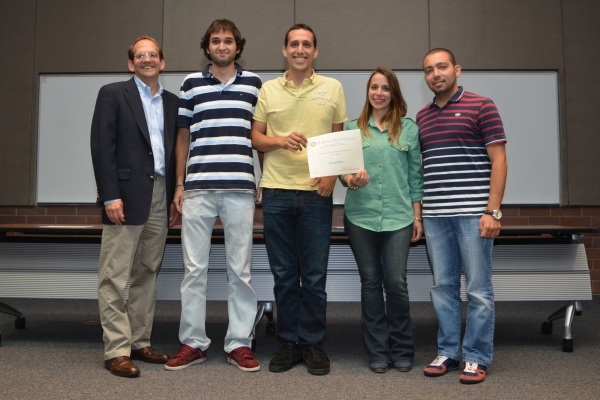 Mentors: Michelle Khine and Zoran Nenadic, associate professors, biomedical engineering, UCI. A Hundred Tiny Hands developed three “Inventor’s Toolboxes” designed to teach children core concepts in engineering and science in a fun and interactive way. The products take the latest discoveries in science and use current engineering methodologies to create an educational toolbox, tailored to children of all ages. The Inventor’s Toolboxes encourage children to explore, create, and invent by allowing them to build their own structures and models. The simple design of these three Inventor’s Toolboxes makes even the most cutting edge scientific technologies easy enough for any child or parent to learn. The team’s goal and vision is to create and foster an online community of young inventors able to interact and share with one another, similar to scientists in real life. Team A Hundred Tiny Hands: Sophia Lin, Nicole Mendoza, Jolie McLane, Eugene Lee, Danny Greene. Mentor: Michelle Khine. Capitalizing on the rapidly growing digital fitness market and the rapidly falling costs of electronics, HydroTrack is a smart hydration tool that helps make keeping track of one’s hydration easier than it has ever been. Using Bluetooth low-energy and a novel flow sensor, HydroTrack transmits how much water one is consuming to one’s smartphone or favorite digital fitness device. The accompanying smartphone application sends gentle reminders when hydration goals are not met, and coaches the user to drink the appropriate amount of water based on activity level. Team HydroTrack: Michael Bryant, Aurelia Darling, Anni Liu. Mentor:Ray Chan, founder, K5 Venture Partners. The app its creators now call “Sparky” is a networking tool. Turning on the app on a smartphone creates a 10-foot Bluetooth bubble around the person. Whenever one “Sparky” bubble encounters another, a silent connection is created. Throughout the day, the app monitors interactions collecting metadata like time, location, and duration. The profile pages and interaction metadata the app offers are so comprehensive that the need to take notes is all but eliminated. Once professionals are ready to follow up, “Sparky” presents them with an intelligently sorted list of everybody they interacted with at an event. Team Sparky: Karan Sekhri, Adrien Deguzman, Sheng Xia, Tai Cao, Derek Omuro. Mentor: Channa Samyanthan (B.S. ’96, ICS), solutions engineer, Syniverse Technologies. “BeatPool” allows multiple music-player users to send songs from their music libraries to one speaker – creating a kind of crowdsourced playlist. Every device that has a “BeatPool” app on it can send songs from its own library into collaborative pool. The system is structured in a way that allows it to function either in crowded environments such as parties, or even on camping trips. Team Sprout: Ekin Oguz, Sky Faber, Cesar Ghali, Fulya Ozcan. Mentor: Arie Shen (B.S. ’88, ICS), vice president, business development, independent consultant. “Ant-mApp” is a mobile and website application that creates a central hub of event information for on-campus events at UCI. It serves as a platform where advertisers of events, such as student organizations and school departments, can meet the seekers of event information, the audience. By allowing users to filter through events and subscribe to groups and categories of interest, “Ant-mApp” will enhance the community involvement and learning experience of UCI students. “Ant-mApp” is a sustainable alternative to flyering intended to grow and strengthen the bonds of members of the UCI community. 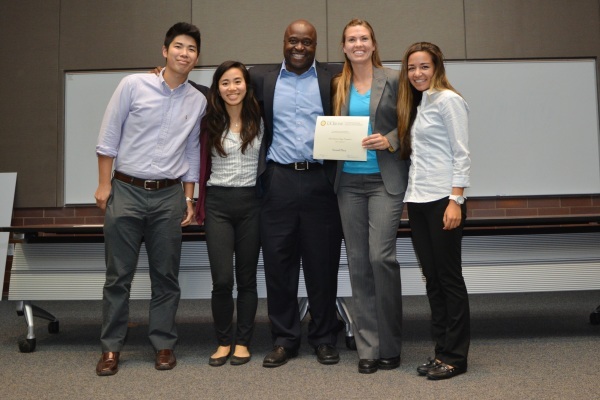 Team Ant-mApp: Alexsandra Guerra, Esosa Agbonwaneten, Yerlan Turekeshov, Avedis Simonian, Maharshi Patel. Mentor: John Herpy (B.S. ’85, ICS), director, strategic planning, Boeing. Ilie Ardelean: Founder, Ardelean Solutions (BS ’96, ICS). Kevin Daly: CEO, MAxxess Systems, Inc., Bren School Dean’s Leadership Council member and past chair. Angela Gribble: President, Small Seeds, Inc. (EMBA ’99, Business). Jon Gribble: President, Taylor-Dunn Manufacturing Co. (BS ’83, Engineering; EMBA ’01, Business). Harvey Kaplan: President & founder, Automated Retail Shops. 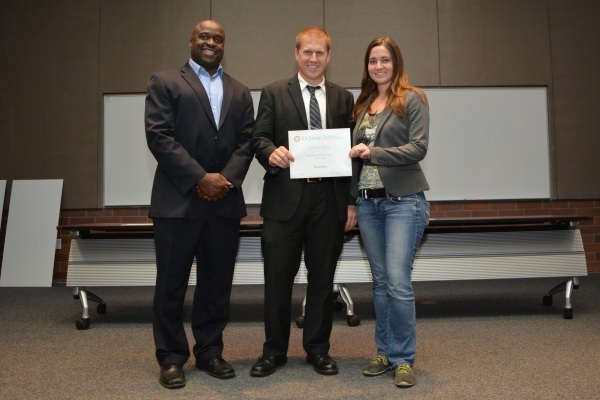 Marshall Parsons, PMP: Manager, product development, Southern California Edison. Tony Crisp: CEO & brand strategist, CRISP^YHKG Brand Agency (BS ’92, Biological Sciences). Kevin Kinsey: CEO & co-founder, Netreo. Roger Lloyd: President and vice chairman, PNT Global. David Ochi: Co-founder, Alpha Sprouts, and executive director, UCI Antrepreneur Center (BS ’97, Biological Sciences and Social Sciences; MBA ’99, Business). Neil Sahota: Thought leader consultant, IBM Global Business Services and Tech Coast Angel (BS ’97, Social Sciences and Physical Sciences; BS ’00, ICS; MBA ’03, Business). Jojo Seva: Chief information officer, CoastHills Federal Credit Union.